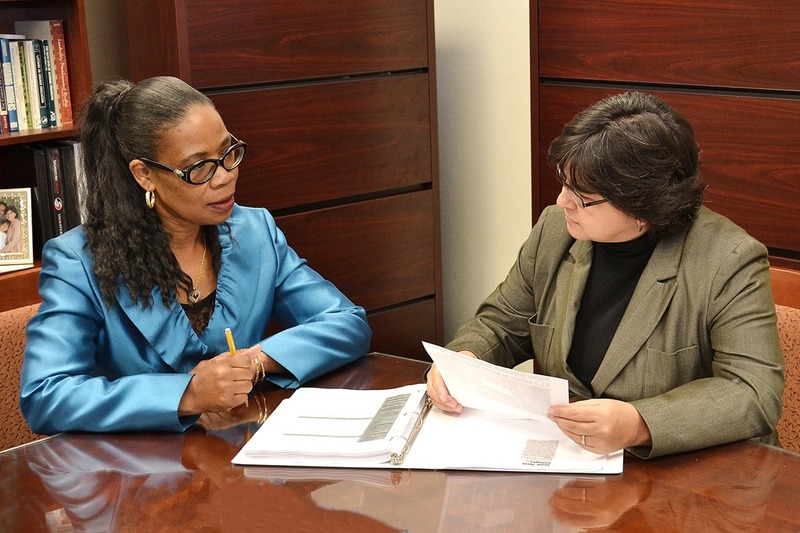 Dr. Denise Hutchinson-Bell, Director of Adult Basic Education, and CBC President Dr. Beatriz T. Espinoza review VAST guidelines. Coastal Bend College is the recipient of a two-year Adult Basic Education (ABE) Innovation Grant from the Texas Higher Education Coordinating Board worth over $321,000 as part of the Eagle Ford Community College Consortium. The Consortium project, called VAST (Vocational Advancement for South Texas) is led by the Alamo Community College District in partnership with Coastal Bend, Laredo, Southwest Texas Junior and Victoria Colleges. These five community college districts are partnering together to help educate and train the region’s under-educated and under-skilled population into one that will be ready to work in well-paying occupations related to the Eagle Ford Shale. “Overall, CBC’s goal is to use these grant funds to help adults gain the skills and knowledge they need for life. They will be independent, self-sufficient individuals who can contribute to the workforce and the communities they live in,” said Dr. Denise Hutchinson-Bell, Adult Basic Education Coordinator at CBC. VAST aims to help ABE students, with or without a GED or high school diploma, who are eligible to work in the United States, obtain jobs in high demand occupations. Many of these students have limited education or English skills, and therefore, have had limited access to college credit programs. Removing these barriers and helping ABE students embark on a career path is what CBC aims to do when the program begins in summer 2013. CBC will offer career pathway training and education in the following high demand occupational areas: certified nursing assistant (CNA) to Licensed Vocational Nurse (LVN), welding, commercial truck driving (CDL), and drafting and design. Students enrolled in these career pathways under VAST will earn either continuing education credit or college credit. Upon program completion, students will earn a level one certificate and be qualified and ready to enter the workforce. “CBC is fortunate to be in a position to have great partners and offer much needed training in our 9,400 mile service area and region. These training programs are clearly aligned with the workforce needs of the industry in our region. Graduates will have great job options available to them,” said Dr. Beatriz T. Espinoza, CBC President. Financial assistance is available for those who qualify, and most VAST career pathways can be completed in about a year. VAST is set to launch in summer 2013 at all Coastal Bend College campuses. For more information, please contact the CBC Adult Basic Education Office at (361) 354-2767.